the captain and president keep the suspense……..who has won? A bright and sunny start for the 40 players (20 pairs), with a strong, cold wind developing. It was good to play the betterball format, where the best score of the pair went on the card at each hole, and the best total in each match winning one point for the team. It was close, with the Captain’ team coming out on top 6-4. The total number of points didn’t matter, all you had to do was beat your opponent’s score. The match between Kevin Smith and myself against Chris McAllister and Jim Alwell was a case in point. We had a great score of 43 points, but it wasn’t good enough – Chris’s eagle 3 at the long 16th was the difference to help them to fantastic 45 points. But that still wasn’t enough to get their team into the prizes – two 46’s took the money! Neil Simpson and Pete Moffitt took the top prize, but Neil gave praise to his opponent on the day, Ken Saunders, who gave him a lesson before play! yes, it’s Dave Lloyd’s team………. Alicia was the MC for the night, here pictured with the winners……. And out on the course…………………. nice to see a full lake behind Kevin………. Jim Alwell sets up to avoid the water on 9……. but he smashed it onto the green and saved par…………. A nice touch in the Clover bar………….Mikey, Chris and Marie have very kindly offered to give a five euro drinks voucher to the winner of each division to be redeemed in the bar that night. (e.g there will be four for a Texas scramble, this week two for best pair and if there are divisions, three). And free sandwiches are still provide at the presentation. Excellent. Don’t forget the AGM on Wednesday – 7pm for 7.30pm start in the Skye Bar, Al Kasar. Some may ask what we do with the money raised throughout the year. An excellent example will be seen in the Clover very shortly – we will have 5 honours boards mounted on the wall at the side of the trophy cabinet. With the 8 majors, we have got 4 boards (2 on each board) and another listing the past captains of the society (speaking of which, next year’s vice captain will be announced by Neil at the AGM). All the boards have now arrived and Kevin will install them ASAP. Many thanks to Anthony Howell who has organised the production of them, and also donated the Past Captain’s board. They are very impressive and add to the professionalism of the society. Here is notice of the agenda for the annual AGM which will take place next Wednesday at 7.30pm at the Skye bar. 38 players braved the chilly conditions of Friday to take part in the Society’s Friday Individual competition. Next Friday is the Captains V Presidents Pairs completion, start sheet is posted on the Society noticeboard in the clubhouse. a wintry scene on the 11th hole…………. We had 51 players in the competition, which included a record 19 ladies! The numbers were boosted with a visit from the Fixby fillies from Huddersfield, who claimed some of the prizes. The stableford was a keenly fought affair, with good scores recorded in all divisions. Following a request from a member, I have included the base handicaps (without slope). could win a beauty contest as well as a golf comp – no, not Neil…………………..
and here are the Fixby fillies………but is that a Norwegian invader 2nd right?……………..
Chris Mc on in 2 at the long 16th, putting for eagle…………. leaving Kev feeling inadequate putting for his par…………. The management of our home base the Clover Bar has now officially changed, but still the same warm welcome from Chris, Mary and Mikey. but does Chris need more training on pint pulling?…………. Next week will be a change of program – as the president is in the UK the President v Captain competition will now be on February 26th. So next Friday will be a singles stableford. Thanks to Dave Cooke, who has donated 100 gift packs which comprise of a pitchmark repairer and ball marker, and both have the society emblem on them. These will be a welcome addition to the prize table each week. Also the membership for 2016/17 will be due from April 1st (still 5€) – a reminder to pick up one of the society diaries for 2016 when you are in the Clover. Polo shirts (15€) and sweat tops (22€) are available from Kevin on Wednesday and Friday nights. A great deal, sold at cost price. The society AGM will take place on Wednesday March 2nd in the Skye bar (formerly the ice cream parlour). Arrive 7pm for 7.30pm start. Proposals and nominations for committee posts should be sent to the secretary – kim@cdagolf.com by Wednesday February 17th. 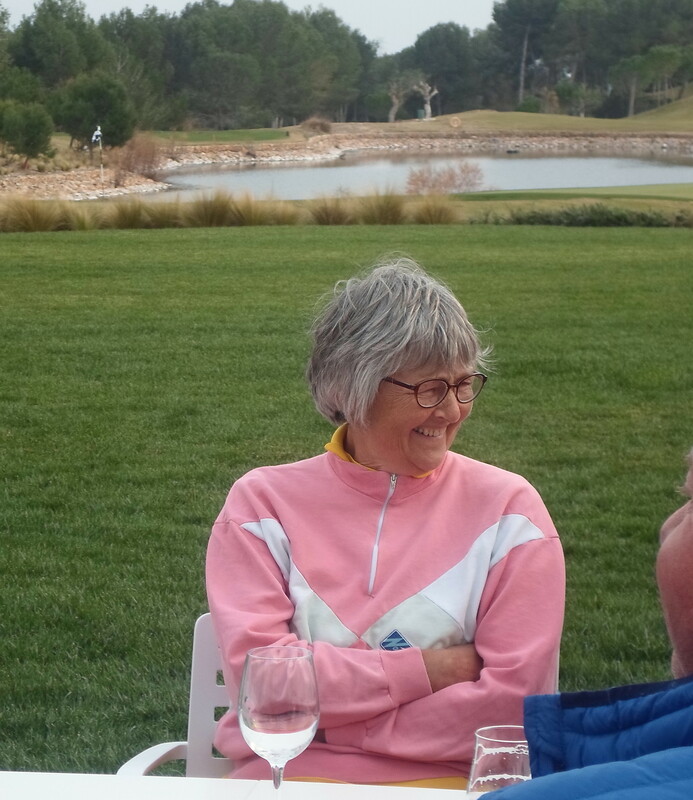 40 players had a great day out at Las Colinas, a modern course near to San Miguel. Our hosts gave us 3 free green fees, which were put back into the pot for our prizes. With free transport, everyone could have a drink which always makes it a better day! Kim & Alicia made up packed lunches for everyone to keep them going for the 5 hour round. The experience at Las Colinas was definitely 5 stars. Everything was perfect, with the customer considered at every point. An impressive drive up to the clubhouse, the course in immaculate condition, surrounded by beautiful villas (more still being built). A very nice bar for pre-golf coffees etc. free course planner, Las Colinas towel holder and pitch mark repairer, free range balls and all the buggies lined up ready to go. They also gave us 3 green fee vouchers………we still charged everyone 55€ but used the 165€ left over from the total cost for the prizes, so no 2€ sweep. Before play we could also make use of the excellent practice facilities – great driving range with a free pyramid of Taylor Made practice balls. The course itself was a pleasure to play……….inviting wide fairways fringed with numerous bunkers (the sand was raked and consistent all the way round), also pretty cork? trees alongside the fairways and generally no problem finding an errant ball (unless it was in one of the many lakes!). I would like to add that the many course marshalls on all areas did a very professional job, keeping play moving and giving information. Post golf was also a great experience….sat on the terrace looking onto the 18th, but the stand-out feature was the service. No queuing at the bar, we had a control pad on the table………..one button for drinks, another for food, and the senorita arrived within seconds of pressing it! Another amazing result was when Barry Answer gave her 50€ for our drinks, but didn’t realise he hadn’t got his change until on the way home on the coach. The day after he rang the clubhouse and explained the problem. The person who answered asked him to wait 5 minutes while he went to the bar. The result was that his 33€ change was in an envelope behind the bar and how did he want them to return it? A fantastic ending to one of the best awaydays ever! 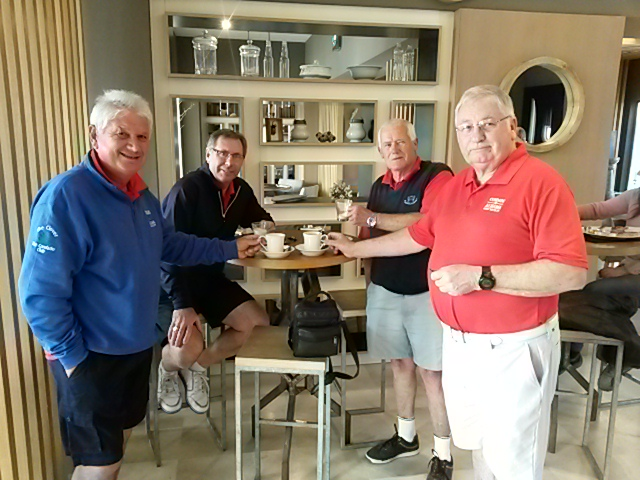 the ladies having a coffee break outside Primark…………..
Peter Beatt & Paddy McKee look like they could stay on the swing all day…………..
start the day with a coffee……………..
Barry B, Paul Briggs, Pete Moffit & Barry A………. the buggies were top of the range…….GPS course planner on screen, facility to range from metres to yards, warning buzzer if you were too near the green info on pace of play – we were 8 minutes behind time and a marshall also politely told us……. and the first game is on the first tee………..
Barry Answer fishing again……..is that why we were 8 minutes behind?……..
and finally on the 18th……………. everyone on the terrace ready for the presentation……. Geoff Hill wins with 35pts. Who would have thought that 2 days later he would win the wooden spoon with 29pts in the Anniversary trophy!…………..
Obviously we were very impressed and thanks have already been give to the staff at Las Colinas, but don’t forget Dave Lloyd, who did a fantastic job of arranging the venue and date to fit in with the first major of the year 2 days later, and managed all the proceedings. This week we had the unusual sight of one of our golfers swimming in the lake on 13…………it was all agreed with the head greenkeeper though, as Pete Elgar swam out to place a total of 40 lilypads in 4 different locations. They are all weighed down with a rope attached to a rock. It will take a few weeks of warm weather and sunshine before we see them blossom, and there are already frogs jumping in from the edge, so who will be the first to actually see a frog on a lilypad? Pete ready for the off with lilies and rock in hand……………. no, it’s not the life and times of Reggie Perrin, with clothes left on the shore……..
rock positioned, lilies in place……………. let’s get out of here, it’s bloody cold!……………. Why did the lilies have to go in the middle of the lake? Because Pete weanted non-golfers to be able to wander over from the Al Kasar and see them. Very considerate! Since then, some of the lilies have moved, whether the rock is detached or the rope has come loose, but no chance of Pete going back in until summer is here! Well done Peter, a nice gesture. this year’s champions, Dave and Kjell………..
Changeable weather for this year’s event, with 59 players (including 4 guests). It is always interesting to see what partnerships the drawn pairs brings out. 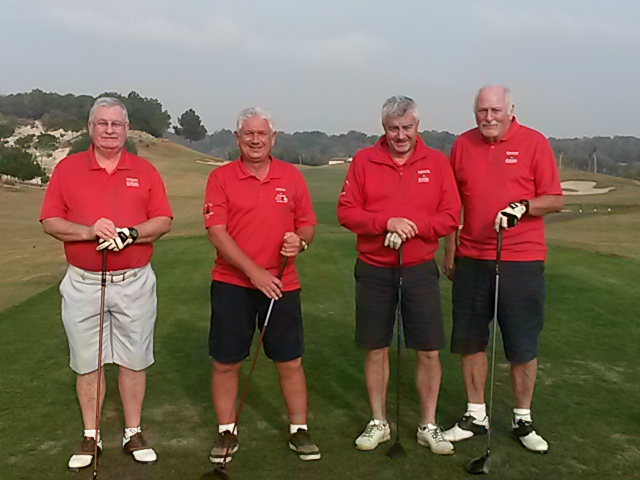 For example, I was paired with Paul Briggs making a rare appearance, so two ex-captains (left handed) together. The current Captain Dave Lloyd off 3.8) drew Luke Harris who played off scratch – the 2 lowest in the competition, which meant a lot of gross birdies would be required to have a chance. Lots more excellent pairings looked like they would be amongst the favourites, and it was Dave Wareing and Kjell Mundheim who blew the field away with a fantastic 47 pts. and in 3rd place, Simon & Alicia, who also won the par 3’s aggregate…………..
Jeff & Lis were 4th, Jeff also got the nearest in 2 prize……. Ray was nearest on 17…..
Julia was the winner of the par 5 prize………. John had to collect the wooden spoon by himself……………. We also had a raffle for all players for an Hacienda del Alamo golf voucher. One player should have had a prize for diving…………Cliff Sparks got very wet when trying to retrieve a ball! Also thanks were given to Lynn and Neil who have done so much for the society……..they have now retired and we hope it will be a long and happy one! and the DJ was the fabulous Bernie Mac…….. Thanks to captain Dave, Kim and Alicia for all the hard work they put in to make the event as success, also thanks to Fred Twomey who took on the role of starter. Also to Chris Ahearn from IRM who gave us vouchers for the prizes. For those of you who don’t already know, Don Henry has been recording the presentations live on an app called Periscope………….try it out, also it can be viewed for 24 hours after recording. as always Don Henry videos the presentation live on periscope………..
A lot to put on, but don’t worry, I have not forgotten the fabulous awayday at Las Colinas last week. Plenty to put on and talk about, so watch out maybe Tuesday or Wednesday next week. Next competition is the February Apollo Air individual stableford on Friday.